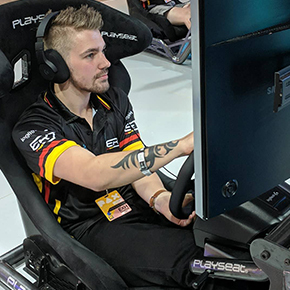 Beau Albert is an Australian Simracer currently competing predominately in the VLN Endurance Series and the Official VRS GT World Championship for Logitech G Altus Esports. Albert begun Simracing on F12013 before eventually transitioning through Gran Turismo 6, Project CARS and finally finding his mainstay at iRacing.com. He is renowned for being a Nürburgring Nordschelife specialist, in particular 2x World Record Time Trial Laps on Project CARS and finding his iRacing claim-to-fame in the VLN series including Top Split Podiums in both Porsche's and GT3 in his debut year, the only driver to have ever achieved this feat. Albert currently competes for Logitech G Altus Esports after a Short Break from Competition from August 2018 to January 2019; winning the Top Split Daytona 24 Hours in GT3 on his first race back. This page was last edited on 8 February 2019, at 14:46.